Deal Month -- Save $10 on this deck -- regularly $39.99! Sale prices are as marked and limited to current stock on hand. Subject to change at any time. SK8KINGS Tagger Street Decks -- 7.5" x 31" WB 14"
Our Tagger Streets are a limited batch of art decks -- pressed in Orange County of color veneers in a double kick/concave street mold. 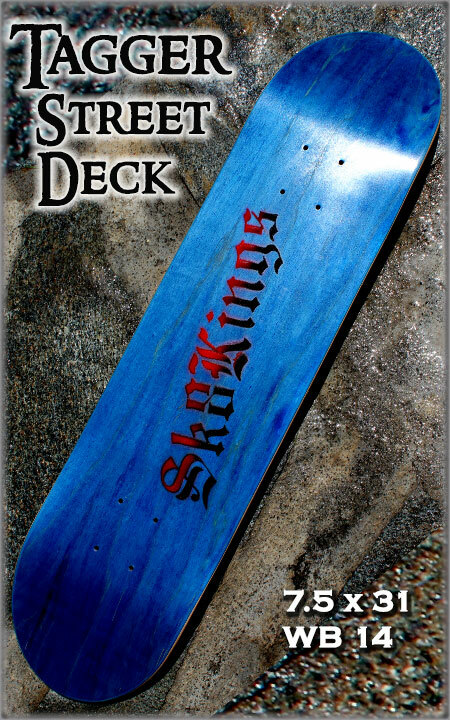 Great deal pricing but still made in a top notch USA wood shop -- we finished them with Sk8Kings graffiti art so every one is different. Requests for favorite colors can be made in the notes section -- can't promise matching but will do our best. Grip tape is available as an optional upgrade. Deck Specs: Dimensions 7.5" x 31" WB 14" 7-ply hard rock maple pressed with assorted color veneers and tagged with hand-painted Sk8Kings graffiti art. Art and colors vary. Made right here in So Cal -- USA Proud.